DOG FASHION DISCO "Who Let the Wolves Out?" I fell into the world of Dog Fashion Disco almost by accident, but once I got in, I found it impossible to get out. And I wouldn't have it any other way. The way this band blows genres apart and then reassembles the shards into something obscenely catchy is unmatched. A lot of people will bring up the names of Faith No More and Mr. Bungle when discussing Dog Fashion Disco and that is understandable, but as is discussed below, it is pretty unfair to compare this band to anything but itself. I don't know of anyone who has mixed ska and metal like these dudes. WORMWOOD CHRONICLES: Was there a magic moment when you knew Dog Fashion Disco was going to be a functioning band again? Was there one moment that stood out in your head? TODD SMITH: Well, we threw around the idea for a while because we're all friends and we enjoy making music together. We kept in contact with each other. We figured, hey, why not put out at least one more album? When we set up our Indiegogo campaign to finance the record, we set a goal of $30,000. By the time it was over, it had far surpassed that. Our fans were so generous we ended up with $86,000 for the final tally, which is unbelievable and just a great testament to how much the fans missed the band. So yeah! From there, it was kind of a no-brainer. Now we're going to start our second record since the comeback in December. TS: Yeah, right! We'll start that new one in December and it should be released sometime around April, just in time to hit the road again in force. Then we'll see where it goes from there. At this point, there's no signs of slowing down. WC: When you broke up before, it was due to general burnout, from what I understand. TS: Yeah, it was due to several factors. The biggest factor was we were having trouble finding quality tours to be the support on, that could take us to the next level. And honestly, we were pretty burned out. In hindsight, would it have been a better decision to take a break? Yes, but everything happens for a reason. All that matters is that we're still doing it and still having fun. WC: Any sort of plan to avoid the same kind of burnout? If you get to that point, will you say, let's just take a year or 18 months off? TS: One thing would definitely be to NOT tour all year around, year after year. That definitely burns a band out quick. You're stuck in a van with all these friends, but it's tight quarters and you're stuck with each other for months on end. You kind of need a break from each other. We've also gotten to the point where we take this seriously and run this like a business. We learn from our past mistakes, we know how to make a living from touring and selling merch. We've kinda figured it out after all these years...(chuckles)...we know how to make a living at this by NOT being on tour all year. We have the luxury of recording at the same studio we've been using for the last 10 years, Rightway Studios in Baltimore. I live the next block over from the studio and they treat us really well as far as how much it costs to make our albums. They're very reasonable with us. We keep the costs low, see a profit, don't tour the entire year and we think we still have something to offer as far as the material goes. WC: You can't beat living on the next block over from the studio for convenience! TS: Oh, it's perfect for a complete lazy bum like me! (laughs) I could literally set my alarm for quarter to noon if we had a vocal session starting at noon. I could brush my teeth, throw on my clothes and walk a hundred steps around the corner and I'm in the vocal booth ready to go! So it's a pretty ideal situation. WC: Have you ever done it that way? TS: Oh yeah! Many times! WC: Going into your own musical background, I'm guessing it's pretty diverse. Was rock music your first love? TS: The first band I was ever really engrossed and enthralled with when I was a kid was KISS. That was when I was about 8 or 9 years old...as I'm sure so many others that age were. TS: Yeah! So KISS was the gateway drug and after that it was Motley Crue and Metallica and then I started getting into more alternative kinds of music on the weirder side...Frank Zappa, Faith No More. Clutch was a huge influence on me when they first started around 92 or thereabouts. When Dog Fashion Disco first started, we were really into ska bands like The Bosstones and Checkered Cab and The Specials and stuff like that, so that influence creeps into the music as well. For the most part, we're rock and metal fans, but I grew up listening to bluegrass, too. My Dad had that on in the house all the time...Johnny Cash, a lot of country. So we have a diverse style of music that we're into. And I think that's pretty obvious from how our albums sound. WC: The Johnny Cash influence was something I would not have spotted right off the bat. TS: Right. We have a few songs that have more of that acoustic type feel, but for the most part, Dog Fashion Disco is a rock/metal band. WC: It's no secret to anybody who's listened to the band over the years that you have tremendous vocal talent. 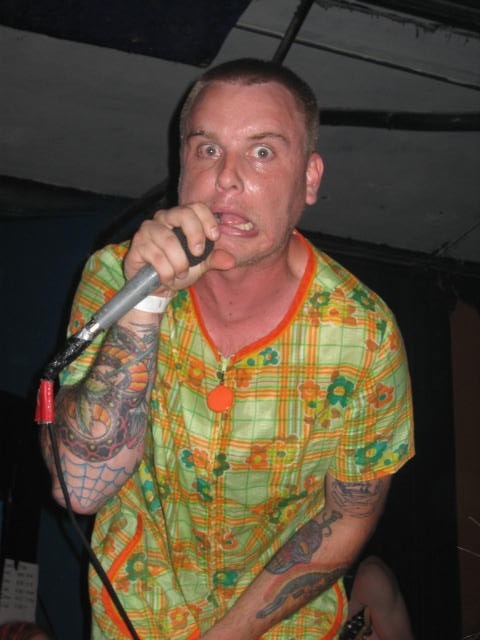 I compare it to the likes of Mike Patton and even Freddy Mercury, who could go from crooning to balls-out rock. Is this something comes naturally or do you have to work very hard at it? TS: Initially, it didn't come naturally. From our very early attempts at writing songs, we were horrible. (laughs) Throughout the years of learning what and what not to do, we've come up with a formula that we use to write pretty solid songs. As far as singing goes, it is something I have to work at. As far as warming up and maintaining my vocal health on the road, that wasn't even an issue in my 20's. I could drink whiskey until the sun came up, smoke cigarettes and eat tacos for every meal and it didn't matter.But as you get older, things change, obviously. Now don't get me wrong, I'm not going to extreme measures out on the road, but I do some warm-ups here and there, I don't smoke cigarettes. A couple of cocktails just to loosen up. I try to eat relatively well. But for the most part, I do warm ups before we play and I try to keep talking down to a minimum throughout the day. As far as singing goes, I don't know if I've got it completely figured out, but what I'm doing works for me and the fans we have. WC: It takes some degree of discipline to keep away from all the temptations. How about the lyrical influences of Dog Fashion Disco? I know you're the chief lyricist. A lot of it sounds like complete absurdity. Is that what it is or does everything have a further meaning if you look for it? TS: I think I've written lyrics for about a hundred and fifty odd songs. We just put out a lyric book and there was something around that amount.. I can't really put a percentage on it of how many songs have a deeper meaning to me and which ones are just tongue in cheek sarcasm and absurd. I would say there's probably a smaller percentage of songs that are personal and mean something to me. The rest of the lyrics just come from me hearing a piece of music and writing the words that pop into my head, my reaction to hearing a riff. To be honest, I don't know where it comes from. Lyrics pop into my head all the time and I catalog them on my phone. I've done that for years. In fact, even before there were cell phones, I would have a lyrical idea and jot it down on a piece of paper and I would compile and compile and compile. When it came time to write a song, I could go back and figure out what section of lyrics was appropriate for what song we were working on, if that makes sense. WC: To me, it seems like cartoons are an influence. A lot of the music sounds like the soundtrack to a demented, tasteless cartoon. TS: (laughs) Yeah. We like to mix it up. Sometimes it's straightfoward, sometimes it's weird. I never thought about the cartoon aspect but yeah, I guess you could say that. We definitely have a quirky side to us, the bands we grew up listening to had that side. But I think we are not only defined by the quirkiness. There are times we have straightforward rock songs. We're an eclectic band, we like all styles of music, so we like to incorporate all of those styles into our songs. We get bored easily, so that's what we do. WC: When I listen to "Sweet Nothings", I look back to the early days of the band and it seemed then there was a lot more of an attempt to be confrontational and offensive. Maybe I'm reading this wrong, the new album seems more mature. Would you say that's accurate or am I just blowing smoke? TS: Well, I don't think we made an attempt to be shocking or crude. Back as far as I could remember, I just wrote lyrics that I thought would grab people's attention as much as a catchy guitar riff or a vocal melody hook. Something that would catch people's ear so they would want to keep listening. But with the new album, there's some dark aspects to the lyrics. I wasn't consciously trying to do anything different than I've done before or the same as I've done before. It just kind of flows out. You hear the music, you write words that you think appropriately fit and then go from there. I'm not really out to prove anything or make any grandiose statements with what I'm saying. WC: There is a healthy amount of craziness with the band. Is it hard to know when to indulge it and when to dial it back? Have you developed more of a feel for it over the years or is it totally instinctual? TS: For me personally, it the whole thing was turned up to 11, crazy, schizophrenic and all over the place all the time, that would get real old to me as a listener. There are times when you have to pump the brakes and have some mellow parts that help the dynamics. When we talk about making a new album, we all have conversations back and forth. "What direction do you think we should go? What are you feeling, what are you into?" For the most part, we want to have songs that people can dance to live, that are aggressive and energetic. And then we want to have some mellow tunes when people can just sit back, close their eyes, bob their heads, whatever. It's like a rollercoaster. WC: The listening audience today isn't quite as attuned to this as they once were. I think of the late 60's and early 70's when your music could be all over the map within one album and people would accept it. Now there are metal bands that are nothing but aggression and horror through the whole thing. And then there's modern pop music where everything sounds like it's from a computer. Do you miss the more eclectic styles of the past? What's your take on modern music fans? TS: The biggest frustration to me and the most annoying thing about the way things are in music today is, like you were alluding to, there was more free reign to explore in the 60's and 70's. And the people were a lot more open-minded. Now our fans are very open minded and they expect the unexpected from us. But what's annoying these days is that people feel constantly compelled to compare. You'll read reviews and interviews where the writer says, oh, they sound like this, this and this. It's not that simple! I know they're trying to explain what the band sounds like. But you just can't be an experimental rock and metal band. You have to be like "they are this genre" and "they are that genre". They try to pigeonhole you. There are so many sub-genres of metal it gives you a migraine! 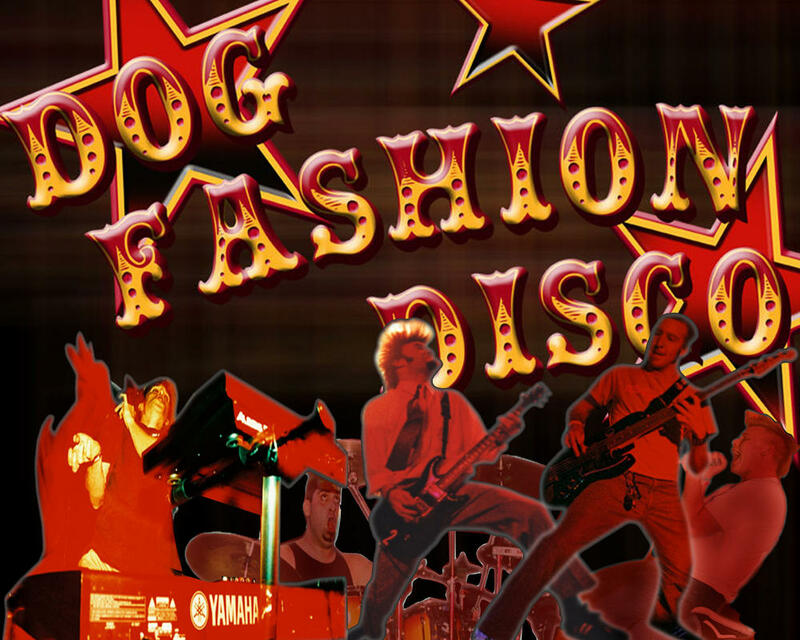 I don't consider Dog Fashion Disco to be only a metal band by any stretch of the imagination. We have metal parts. I would say we're as much a metal band as we are a punk band or a hard rock band. All the labels and genres and people trying to put things in such small parameters...that's really annoying to me. When we're writing our music, we think of it in a much broader mentality. WC: I can't excuse myself. There are times when I do that too. TS: That's fine, that's to be expected. As a reviewer or an interviewer, you want to give people a kind of idea of what the band you're talking about sounds like. I get that, I get that whole thing, but we get a lot of comparisons to Faith No More. I get that,too. There's a lot of people saying we're a Mr. Bungle rip-off. There's so much more to us than that. I'll take little bits of tons of influences I have. There's just as much Radiohead and Clutch in our music as there is Faith No More and Mr. Bungle. In the mellower stuff, there's as much Johnny Cash as there is Tom Waits. I don't know. WC: It seems to me when listening to Dog Fashion Disco that the catchiness of the tune itself is paramount.. Let me move onto the cover image for "Sweet Nothings", with the dark take on the "Little Red Riding Hood" character. Was that your concept? TS: I don't even remember who actually came up with that idea. We have so many conversations that go back and forth. I think we came up with the idea just spitballing ideas. I think it might have been our guitar player Jason but I honestly don't know. That's quite sad, because it wasn't that long ago. (chuckles) We decided on the album title first and the irony of the idea of "Sweet Nothings" being mixed with this Red Riding Hood concept played into it, even though it's a snarling wolf with a little girl whispering anything but "sweet nothings" in the wolf's ear. We've had some really stupid covers in the past and this is one of the best ones, I think. TS: My God, I don't even know what we were thinking! WC: That's kind of what I meant when I said you matured a little bit. You had the toilet on the cover and another album called "Anarchists of Good Taste". TS: "Committed To A Bright Future" that had the toilet on it was supposed to be a tongue-in-cheek ironic comment with the entire bathroom covered in blood and pills in the sink. It was supposed to be "ha ha, committed to a bright future". Then the label or the distributor, I don't know which, said you can't put bodily fluids on a cover unless you're Metallica. So we had to strip the whole thing and there was just a smiling face in the sink. So it ended up being kind of lame, but that was a record label thing. WC: That was definitely the record that opened my eyes to the band. I bought it on a lark and I was really blown away. Since then, I've been looking for new product from you.. There's one thing you did on the new album that's very unique. How cool was it to do the "hidden track" where you went through the names of everybody who contributed to your Indiegogo campaign? TS: I think it's about ten or eleven minutes long. I just started reading the names off and the studio engineer would cut out whenever I butchered somebody's name or when I had to take a breath. He strung all the names together. Man, some of those names were really tough! (laughs) There were some names from Scandinavian countries and I was trying my hardest not to butcher their names, but at the end of the day, I had no idea how to pronounce some of them. I hope they found some humor in it. WC: To my knowledge, nothing like this has ever been done before. It's like a vocal "thanks" list. TS: I don't recall anything like it either. When we were coming up with the Indiegogo campaign, we were trying to be creative with the perks and that was one of the things we came up with....to get your name in the "thanks" booklet and also have it on the last song. That was something that a lot of people gravitated to. Yeah, I don't think it's ever been done, but I think it was pretty cool. WC: Now you explain how it was done, it makes more sense. I thought, my God, if this guy did this all in one take, that's like running a marathon in five minutes! TS: Technically it was in one take, but there was some serious editing going on. WC: Now that you're committed to being an ongoing band again, any idea how you'll evolve in the future? TS: Well, I think we're pretty comfortable in our writing shoes, creatively. As far as evolving, maybe we'll try to one-up ourselves with each album. At this point, I don't know if that's possible. I think just consistently putting out music that we believe in, that comes from the heart. that isn't phoned in, is pretty much what we're about and what we're going to continue being about. We'll just try to keep the business rolling smoothly and do three or four months of touring a year. The rock and roll train rolls on! WC: Any concrete live plans right now? TS: It's too early to make the call right now. There are a couple of ideas floating around for us doing a couple of co-headlining tours next year but I don't want to say anything in case they don't turn out. We should be out on the road by April, tour throughout most of the summer and then just do a couple of things in the fall. We don't like to go out in the winter. Touring in Iowa in January is not the smartest idea. We did a small little run of shows last December and one of them was in Des Moines, IA and I remember it was horrible weather when we were leaving town. The highway was a sheet of ice and cars were flying off the roads. We said, never again. We're not doing this in the winter. We've got a few shows in December this year, though, but nothing crazy. WC: If you could choose any 3 people from history to have dinner with, who would they be? TS: Oh wow! Well, I would definitely have dinner with Bill Hicks. Maybe Elvis would be another one. Let's see, let's go way back...how about George Washington? I'd like to pick his brain. TS: I think the last CD I purchased was "Diamond Eyes" by Deftones but that was a few years back. As far as iTunes, the last thing I got there was actually "Appetite For Destruction" by Guns N Roses. We're actually covering their song "It's So Easy" in my other band, Polkadot Cadaver. I had that on CD and lost it years ago so I thought I would download it again because it's a killer record and we're covering one of the songs. WC: How about the last live band you saw just because you wanted to? TS: I'm trying to think....last band I saw. To be honest, I don't recall! We play so many shows that when we come home, I tend to hibernate. I can tell you the next band I'm going to see. Clutch at 9:30 Club in Washington, D.C. on New Year's Eve. I've seen them probably 30 times and I still get giddy like it's my first time. WC: Is there any Spinal Tap moment in the history of Dog Fashion Disco that you could share with the readers? WC: (laughs) With Artie Fufkin looking on? WC: "We were told there would be massive radio support!" WC: It's like Bon Scott said, it's a long way to the top if you want to rock and roll. TS: That's right! We're nowhere near the top, but we're doing alright! TS: We're about to head out to Mesa, Arizona for a tour. That will be the first show of a tour with my other band Polkadot Cadaver. That's basically Dog Fashion Disco minus the saxophone player and the keyboards player. That starts in Mesa, goes to LA and then works its way back to upstate New York. We're covering 20 major cities around the country. If people want to figure out where we're gonna be, they can check our Facebook and hopefully catch a show!